Producers of frozen, scoop and bake, gourmet cookie dough for the fundraising industry. Company profile, products and fundraising details. Reviews and Comments for Aspen Hills, Inc.
Offers chocolate desserts including chocolate lava cakes, chocolate sacher torte, fondue, fondants and childrens treats. Company and product details. Manufacturer of industrial chocolate for the dairy, confectionery, nutritional and food manufacturing industries. Offers chocolate coatings, chunks, drops, flakes, cocoa powder and ice cream coatings. Producer of Belgian-style chocolate. Products, chocolate information and franchising. Sales and rentals of chocolate fountains for parties, anniversaries, weddings, and other special events. Provides molded chocolate promotional items and gifts. Manufacturer and marketer of chocolate products since 1852. Wholesaler of chocolate products and confectionery decorations from various manufacturers. Product details and ordering options. Manufacturers of chocolate, chocolate compounds, fondant, fudge, cake decorations and ice cream coatings. Chocolate candy producer. Includes Kidz Town, gift shop, recipes, Chocolate World visitors center, plant tours and philanthropic information. Maker of box chocolate candy for over 60 years specializing in chocolate cordial cherries and other seasonal candies. Supplier of fine European handmade chocolates, including custom logos, chocolate coins, wedding favors, gift baskets and corporate gifts. Serves industrial chocolate manufacturers with custom molds for fully automated, semiautomatic and manual chocolate molding lines. Includes a history, profiles and details of products and services. Located in West Babylon, New York, USA. Publishes a series of books about the Adventures of Sunny & The Chocolate Dog. Offers Soya King soy chips, soy cheeses, alternative grain pastas and fat free cheesecake. A small online gallery of Bettie cheesecake. US chain of full-service restaurants, specializing in cheesecakes for dessert. History, menu, locations, online ordering, and investment and employment information. Manufacturer of 3' individual, miniature, 7' and full-size mousse and cheesecake desserts. Includes product details. Located in Westbury, New York, USA. Manufacturer of French chocolate for cooks and candymakers. Custom business messages wrapped around a chocolate bar. Chocolate manufacturer in the French tradition. Creates personalized candy or chocolate bar wrappers. Offers product and nutritional information. 32 Elit Chocolate and Confectionery Turkish manufacturer. Turkish manufacturer. Company, products, news and FAQ. If the business hours of Aspen Hills, Inc. in may vary on holidays like Valentine’s Day, Washington’s Birthday, St. Patrick’s Day, Easter, Easter eve and Mother’s day. We display standard opening hours and price ranges in our profile site. 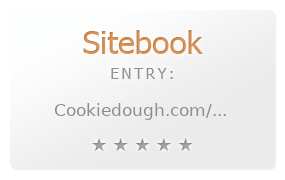 We recommend to check out cookiedough.com/ for further information. You can also search for Alternatives for cookiedough.com/ on our Review Site Sitebook.org All trademarks are the property of their respective owners. If we should delete this entry, please send us a short E-Mail.